Dr. Periman is fantastic and really knowledgable about dry eye disease. She really wants to help people. Unfortunately, I live in Italy but she helped me through Skype. I developed dry eye two years ago after isotretinoin … I hope to personally visit Dr. Periman in the near future! Dr Periman, Thank you so much! You help me to have faith in this hell! “ I have been obsessed with skincare since I was 12 years old. As a teenager, I used to use my mom’s fancy department store anti wrinkle creams because I love the way they smelled and felt on my skin. Another obsession of mine is makeup and even though I do not wear a ton, I pride myself on knowing what the latest makeup trends are. My nightly skin care regimen consisted of my favorite products like Retin-A, high potency acidic face washes, and lash growth serums. I thought that I was “taking care” of my skin by being diligent about my nine step nightly beauty routine. In 2017, I met the dryeymaster, Dr. Laura Periman. 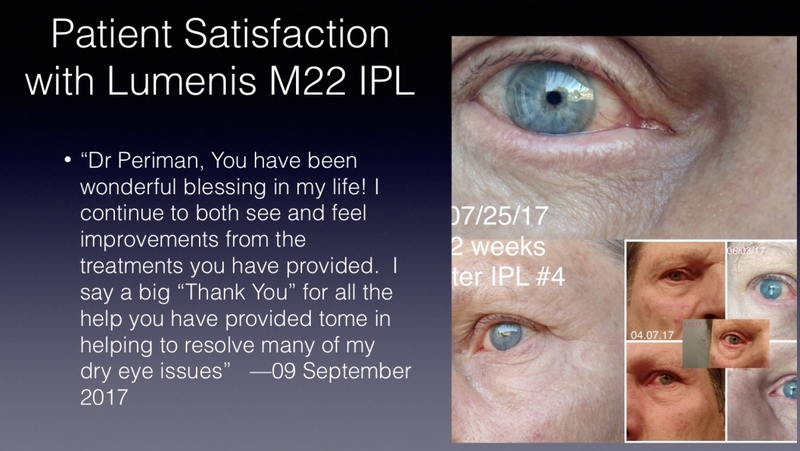 Through Dr. Periman’s thoughtful way of educating patients as well as her own peers, I quickly learned that most of the products that I was using were completely toxic to my eyes. Dr. Periman’s clever ways of education helped me identify not only what not to use, but I also understood what these “no-no” ingredients were doing to my physiology. I was shocked to learn that I could have been doing some permanent damage to my corneal nerves as well as to the vital tiny little glands that help with producing the oily part of my tears. Dr Periman, you have been a wonderful blessing in my life! I continue to both see and feel improvements from the treatments you have provided. I say a big “Thank You” for all the help you have provided to me in helping to resolve many of my Dry Eye issues. Having a physician like Dr Periman-who genuinely cares for your health and well-being is an incredible asset. Whether you are a coworker or patient, you always feel she is on your side and on your team. In the time that I worked with her, I saw many patients benefit significantly from both her counsel and treatment. 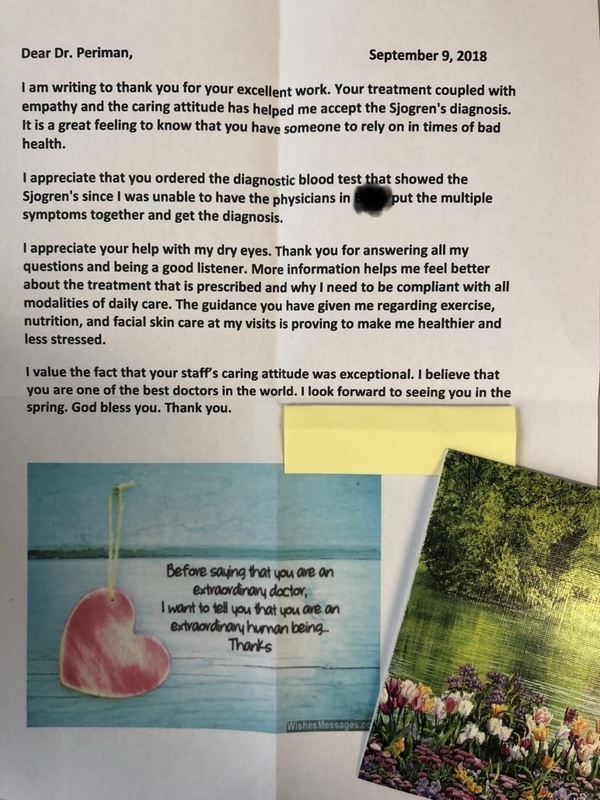 Her approach to patient care always stems from a place of compassion and empathy, but she is also clear and direct. She is especially well-suited for complex and difficult cases, requiring high levels of energy, intricate problem solving and enduring patience. It is also worth mentioning that, to her, integrity is essential. She is always honest and makes decisions motivated solely by what is in the best interest of the patient. Truly one cannot go wrong with Dr P.